We'll skype with you to show you PeerStudio features, how it can fit into your course, and even the research behind it. How do you plan to use PeerStudio in your class? PeerStudio makes peer feedback easier for instructors to manage, and students to learn from. It automates away the tedious aspects of peer reviewing, and learners use a comparison-based interface that helps them see work as instructors see it. More than 4500 learners in dozens of universities use PeerStudio to learn design, writing, psychology, and more. PeerStudio leverages the theory of contrasting cases: comparing similar artifacts helps people see deeper, subtler distinctions between them. Think of wine tasting. It's much easier to notice the flavors when you compare one wine to another. When students review in PeerStudio, they use a rubric that instructors specify. 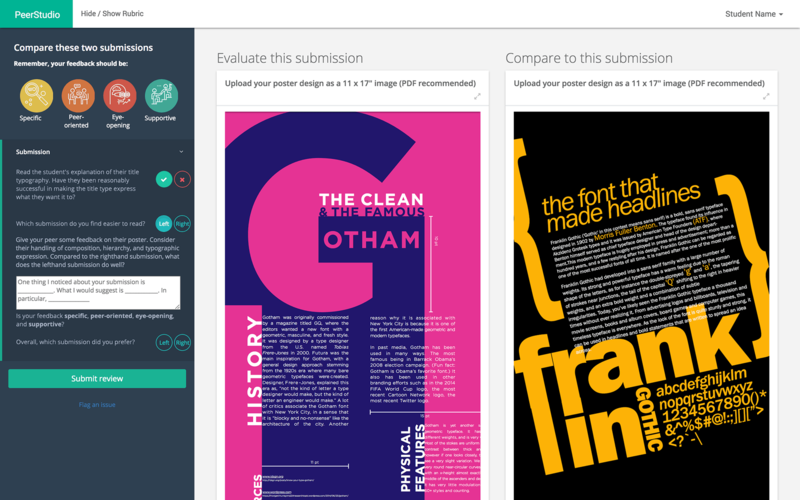 In addition to the rubric, PeerStudio finds a comparison submission within the pool of submissions from their classmates. While reviewing, students compare the target submission to this comparison submission using the provided rubric. PeerStudio uses an artifical-intelligence backend to find just the right comparison for each learner and submission. (Among other features, we use learners' history of reviewing, and that of their classmates to identify optimal comparison submissions.) This backend is always learning, with accuracy improving even within the same assignment. Learners often want to review well, but don't know how. We both help students learn how to review through interactive guides, and automatically detect poor reviewing. Most students in college today see so little of the amazing work their classmates do. PeerStudio creates an opportunity to see inspiring work and get more feedback on it. Instructors also tell us that their students enjoy writing, designing and completing assignments for a real audience, and how the benefits of peer reviewing spill over into clearer presentations and more insightful questions in class. PeerStudio is cloud-based, so it is available from any computer, and allows students to view most common assignment materials without any additional software: PDFs, videos (including auto-embedding Youtube), formatted text (bold, italics, tables,...) are all supported. And because it's backed up every night, your students (and you!) never have to worry about losing work. With traditional peer feedback tools, instructors have more, not less, work. You not only need to write the assignment and the rubric, but also assign students to review each other, make sure they do it on time, re-assign students who miss the deadline and so on. PeerStudio automates it all. It uses an AI-backed to assign reviewers to submissions, automatically deals with balancing out reviewer load, and more. It even sends email reminders to students who haven't submitted their work or reviewed others. PeerStudio automates the busywork, but you remain in control. On your dashboard, you can grant one-time exceptions, track who's late, even read individual reviews. Many instructors also use their dashboard to find examples of excellent work to show in class, or to recognize excellent peer feedback. We can help you implement peer reviewing correctly and set up PeerStudio in your class. To get started, schedule a time to chat with us. PeerStudio has helped teach everything from design, English, music, and more. "PeerStudio got my students writing, teaching, talking, and moving in class. They came to me surprised to read their peers' work, challenged to offer constructive feedback, and excited to edit their writing craft. Structured but open-ended rubrics let me scaffold the process, allowing them to develop a sensibility for what quality work looks like." "PeerStudio focuses on providing the support students need to create the very best projects they can." We're also happy to help you think through introducing peer reviewing in your classroom, regardless of whether you use PeerStudio. Get in touch with us at hello@peerstudio.org.